There's a new object library that's now up and running, RTMM Required Object LibrariesFSXP3D Part IV_02.11.19 This is a mandatory maintenance upgrade. Failure to install will result in scenery problems! The entire process should probably take less than 45 minutes to complete. The library package contains various fixes and improvements to a number of RTMM object libraries and RTMM scenery files. It is EXTREMELY important to carefully read the documentation found n each folder in order to make the changes and additions to your RTMM installation as easy and efficient as possible. It is imperative that ALL of the files in this package are installed, without skipping or ignoring any of them. Failure to do so can, and will, make it difficult to RTMM staff to debug future issues users may have with their scenery. It also consolidates objects, textures and effects that were scattered around in numerous scenery files. The sceneries that they were pulled from have been repackaged, and you should download the new versions, delete and replace with the newest. Full documentation is enclosed in the RTMM Required Object LibrariesFSXP3D Part IV_02.11.19 download. Keep an eye on the scenery page for the latest versions. I'd like to give a big personal thank you to Doug and Norm for helping me fix the bugs and in making sure that everything is up and running correctly on the website. Their work and help behind the scenes was incredible. Cool - a number of item's I'd been waiting on the update for have been re-vamped (Yes Bay Lodge in particular!). I've tried multiple downloads, to no avail. Anything I can do from my end to resolve it? 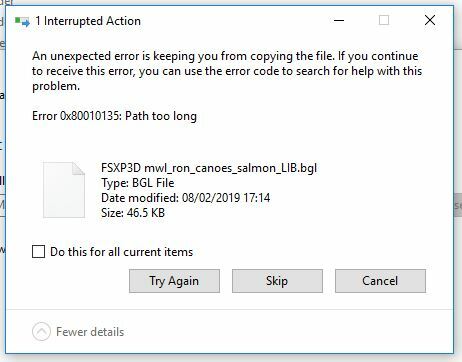 That error usually means when that directory's path that you are extracting to when added to the files you are extracting forms to long of a path for windows to handle. Did you try extracting to a small path name like: C:\Hold where an empty hold folder has been created in your root directory? Great job Steve on getting the update for the libraries out! And thanks to Norm and Doug for their support on this effort as well as Doug's leadership effort on refreshing the sceneries which also allows for some of the object library consolidations. I installed the new required updates and the new mandatory RTMM library 4 without any problems, descriptions are clear to understand and to apply. What an amount of work for the "maker" - many thanks Steve for your efforts - great job and well done!!! Thanks also to the other members of the RTMM Team being involved in this big "Refresh Campaign"! Thanks guys. It was an effort that took lots of concentration and countless hours of work. Great Work Steve!! Didn't take me long either. Just take the time to read the instructions and users should not have any issues. Thanks stiletto2/Rod, your diagnosis is spot on - total brain-fart on my part. Moved to a shorter folder path, unpacked absolutely fine! D'oh! Cheers! Once my uh, lapse of concentration, was sorted, instructions clear and easy to follow, didn't take long to install and seems to be working all fine and dandy now! Question........What should the folder be named in the file library? RTMM Required FSXP3D Libraries Part IV_3.21.19 OR RTMM Required Object Libraries FSXP3D Part IV_03.20.2019? Or does this matter? The NOTAM mentions 21 - the download is 20. Name of the folder makes no matter at all as long as you have that folder linked to your scenery lib. It is kind of misleading. The official name is actually RTMM Required FSXP3D Libraries Part IV_3.20.19 a. The "a" means that it was the second release version on 3/20/19. The "a" was actually left off of the folder name inside. Maybe Doug can quietly fix the name behind the scenes. But like Norm says, the name at this point doesn't really matter as long as you have the official one from the object library page. If in doubt, re-download.